I first came across Block Lotto in April 2010, when I was looking for liberated quilting inspiration and found it in Sophie’s blog. 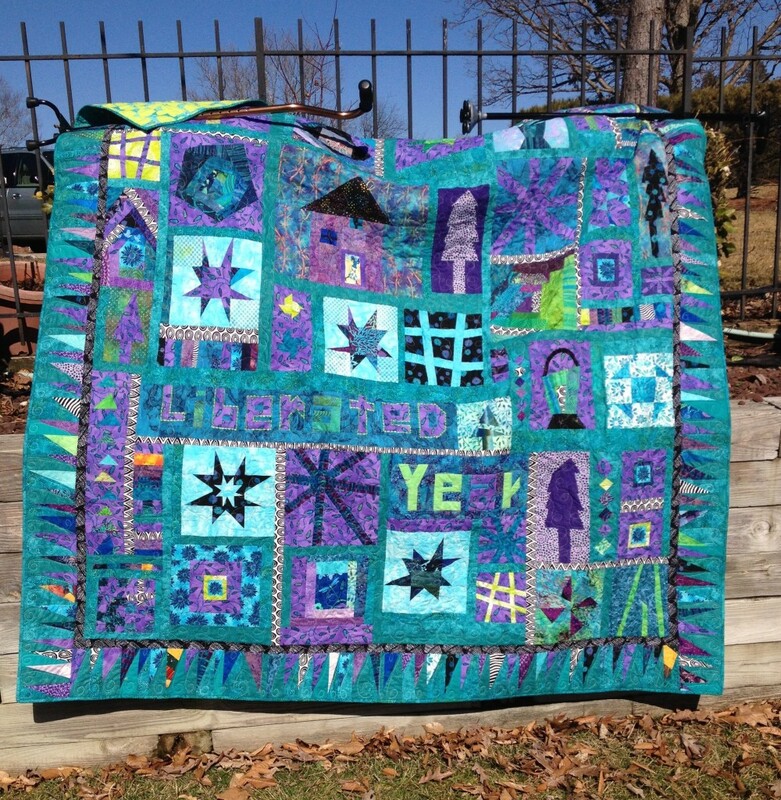 Being someone who ‘never’ wins these kinds of things, I decided that I would make blocks of my own around a focus fabric (the purple fabric–which has green and teal vines) while participating in the Lotto. Then I went back and did January/February/March. I think you can see some of my blocks from that year in the Illustrated History. Honestly, I think I could have finished it a year earlier if I hadn’t fell in love with a liberated Sawtooth border in Gwen Marston’s book. That border is perfect for your sampler. I was just thinking about our “liberated year” earlier today … It was so much fun. I think your sampler reflects that fun year beautifully. Wow, what a terrific quilt. I love the liberated feeling and that wonky, spiky border is just the piece that ties it all together. Thanks for sharing. Ps. I edited your post this morning to rotate the images (and set one as the featured image so that it would fill the slider on the home page). Looking at your quilt again, I am thinking of making my own sampler from the blocks from that year. Your quilt really is a great liberated sampler. Thanks Sophie. Weirdly, I spent time last night trying to figure out how to rotate the pics in WordPress because they uploaded in the wrong orientation. One day I’ll get it right. (And thanks for the praise of the sampler. I’m really pleased with how it came out. Fantastic!!! I love your quilt!! 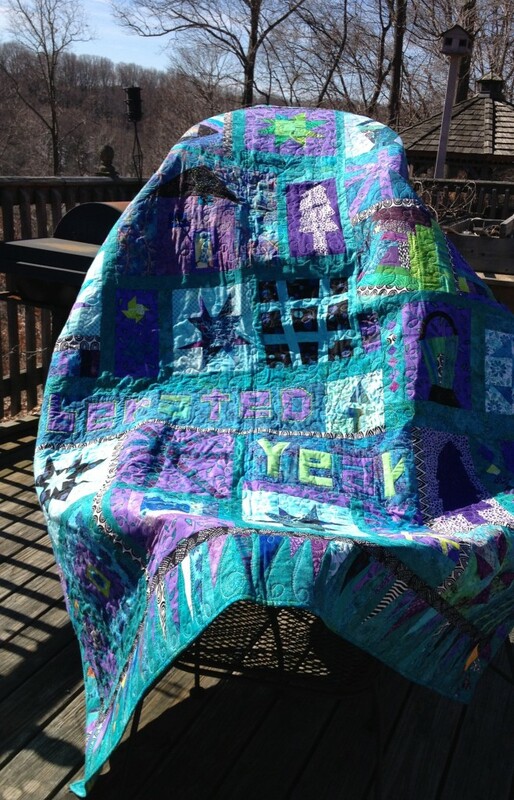 I love seeing what quilters come up with when they are inspired by Block Lotto. Terrific colors. What a fabulous Quilt!!!!!! Oh it’s so exciting and in all the best colours!!! I just love it!!! Congrats on a fabulous finish! I love your quilt — the colors are superb and there is so much to look at and enjoy. The border is perfect. Love the quilt and the colors you used. Guess I didn’t belong to Block Lotto that year. WHat a wonderful quilt!! You don’t see teal often as a background and it’s just perfect. Love the border, too.! Now I know why you don’t see teal that often. I had two versions of teal– a largish piece my Mom gave me and a piece I bought. But when I started it laying it out, it became clear I would need more. I literally went to every vendor at the Mid-Atlantic quilt show and found a beautiful teal in the last aisle! I know that somewhat violates “liberated” principles, but I’m really happy that they blend so well. What a beautiful, eclectic, bright sampler! I love it -the colours are fabulous and liberated blocks are my favourite. I think that was my first year in block lotto too. Love this quilt! Love the colors! Love everything! I joined the month of the trees! Fantastic quilt…Colours really set the mood for FUN…HAPPY…all is well feelings….Wonderful!